When newly appointed Indian Prime Minister Narendra Modi tweeted “India has won, good days are here again,” you would think that his message was a reflection of universal jubilation across the country. However, while his landslide victory was more convincing than any in the country’s recent history, the joy felt by his supporters was met with equally vociferous dismay from his many opponents. Upon his election in May, Modi was hailed as the saviour of India’s economy and the man who would kickstart the country into taking a dominant role in global affairs. Despite the welcoming tone from those fed up with the corruption and dynastic feel to Indian politics for much of the last few decades, there were also many that were dismayed by Modi’s victory. In particular, the country’s minority – yet considerable – Muslim community will have greeted his election with grave concerns that the government would not be acting with their interests at heart. This sentiment stems from his role in the terrible riots seen in 2002 in his home state of Gujarat. During those riots, hundreds of Muslims were murdered by Hindu mobs, and Modi – a Hindu nationalist – failed to condemn them. It has meant that many of India’s Muslim community have immense ill feeling towards him, presenting a considerable hurdle for him to overcome. The manner in which Modi’s Bharatiya Janata Party (BJP) swept to power surprised many observers, especially after the Congress Party dominated for so many years. However, the result shows that Indians had become fed up with Manmohan Singh’s government, and much of this resentment stems from the perception that India has wasted a decade when it should have been powering ahead economically. The Congress Party had governed India for a staggering 55 out of the 67 years since independence. The defeat to the BJP was the worst performance in history, with just 44 seats secured in the lower parliamentary house – the Lok Sabha. This means Congress is not even the main opposition party anymore. Upon his inauguration as Prime Minister in 2004, Singh was expected to oversee a period of rapid transformation. Singh had enjoyed acclaim for his economic acumen and previous experience running the country’s finances, as well as not being linked to the corruption scandals that had beset many within the Congress party. Many expected Singh to harness the country’s vast potential by shredding much of the country’s labyrinthine bureaucracy, therefore helping to create a more democratic economic powerhouse in Asia rival to China. However, in the run-up to May’s election, many of the same calls for reform that were made 10 years ago were being heard once again. The lacklustre pace at which India’s economy has grown has led to Singh being dubbed a disappointing leader that has struggled to implement any meaningful change. Another crucial reason why Congress suffered such a heavy defeat was the long list of corruption scandals to hit the government over the last decade. Corruption has become endemic throughout all levels of Indian society, but Congress suffered a multitude of scandals during its time in office. These include the 122 telecommunications licences awarded since 2008 under former minister Andimuthu Raja, which then had to be cancelled in 2012 after accusations of mis-selling. It’s thought that the licences cost India around $40bn and the scandal has been described as the country’s biggest to date. There was also a bribery scandal which hit the army in 2012, with a defence industry lobbyist offering an army chief $2.7m for ‘sub-standard’ vehicles. And there were a series of ‘cash-for-votes’ allegations to emerge from Wikileaks in 2011. These wrongdoings have done great damage to the reputation of the establishment in India, and it is Modi’s positioning of himself as a corruption-free outsider that has appealed to the majority. In order to stimulate growth, Lalwani believes Modi needs to look at a number of areas that are holding back the economy. He says Modi must reduce the country’s spiralling inflation, while also accelerating the economic reforms that have long been promised by his party and their predecessors. He also calls for the government to “contain fiscal and current account deficits”, two important aspects that have got out of control in recent years. Immediately after the election result, however, Modi was provided with some good news on this front, with the current account deficit dropping to its lowest point in four years during the first quarter of 2014 (see Fig. 1). This represented a shortfall of just $1.2bn, compared to $4.2bn the previous quarter, and is thought to be as a result of higher tariffs that had slowed gold imports. According to Lalwani, Modi’s vision of India is of a country with a strong economy and robust defence, carrying significant influence on the world stage. He believes that the government should be stripped back, with his mantra being “less government, more governance”. Modi’s performance as Chief Minister of Gujarat since 2001 – where he raised economic growth rates, improved infrastructure, eradicated corruption and cut down regulations – has led to the country’s millions hoping he can do the same on a national scale. 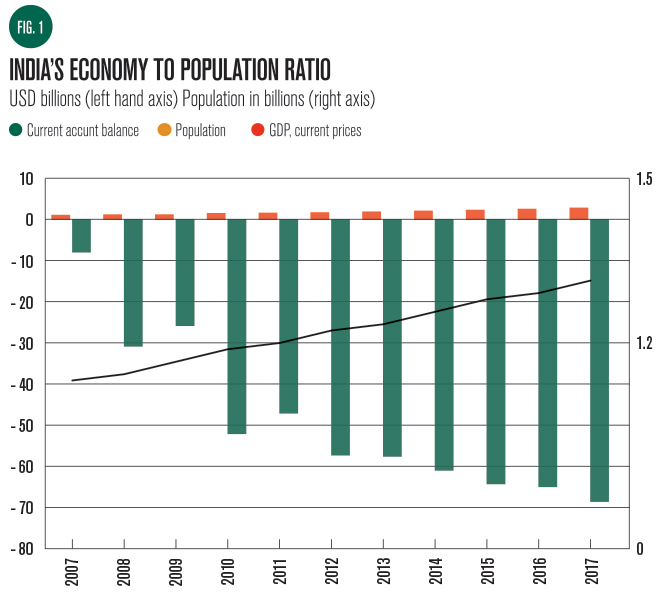 Lalwani added in a note, shortly after the election, that getting the economy started would not be easy, and that there was no ‘magic wand’ that could speed up growth. However, he said that such a large parliamentary majority for Modi would allow him to be a ‘decisive doer’; giving the country its best chance of passing some serious and meaningful reforms. Modi won’t get it all his own way, however. While he has secured a massive majority in the Lower House of India’s parliament, he doesn’t enjoy similar sway in the Upper House. 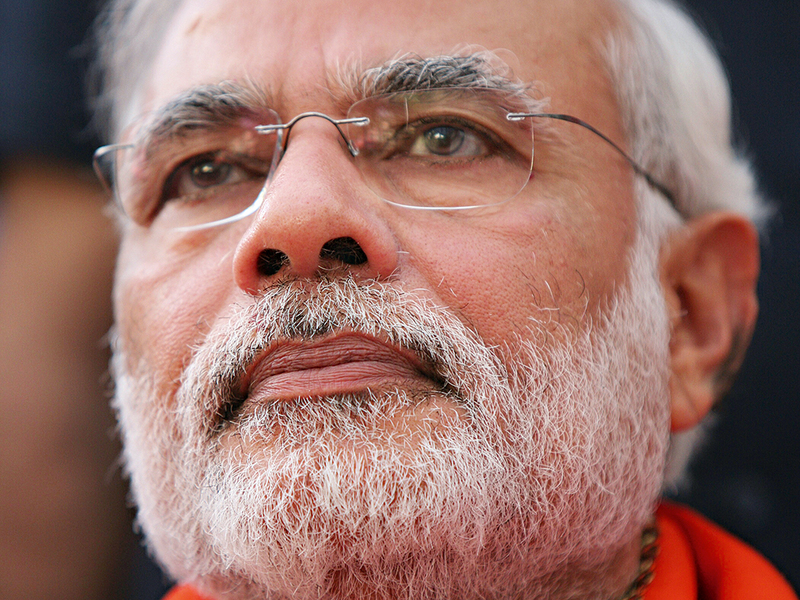 “A key challenge for Modi will be to push legislation through the Upper House where BJP lacks strength. And successfully navigate through India’s complex federal structure, where state Chief Ministers play regional politics,” says Lalwani. According to recent estimates by the World Bank, India’s economy will grow at around 5.5 percent during this year, a downward revision from January’s 6.2 percent forecast. While this is an improvement on recent years, it is not the soaring rate that many had hoped India would be achieving. However, the World Bank does expect growth to accelerate to 6.3 percent next year, and to 6.6 percent the year after. In order for Modi’s government to achieve yet further growth, there will need to be a solution to its soaring inflation, as well as a winding down of its famously prohibitive bureaucracy. While Singh made some decent steps towards deregulation by agreeing to the Indian Financial Code, thereby simplifying financial law, much greater strides need to be taken by Modi to ensure that businesses find it easier to operate, without having to tick a never-ending list of bureaucratic boxes. Perhaps the main criticism is that India should have invested in is its woefully inadequate infrastructure. For a country that has population of over 1.2 billion, there should be a vast network of infrastructure in place. Instead, the country’s road network is underdeveloped, its energy provision is severely unreliable, and its telecoms service is infrequent. While the rail network is certainly extensive, it still doesn’t serve many of the country’s poorer communities. For years there has been talk of building grand infrastructure schemes that would bring the country up to speed with the rest of the world and transform the lives of India’s many poverty-stricken citizens. However, for all the talk, little has actually been built. A total of 36 major infrastructure projects had stalled last year, and so Modi has a number of large schemes that need to be revitalised to help spur growth. Projects that need to be started or completed include many small airports, the Diamond Quadrilateral of high-speed trains, and the ‘Sagar Mala’ project that will better connect India’s ports. Another thing that needs to happen is a boost to the manufacturing industry, and the subsequent job creation that will come from it. With millions of unemployed young people and a population growing at an alarming rate, India is seriously in need of stimulating its manufacturing base so that there are enough jobs to go around. 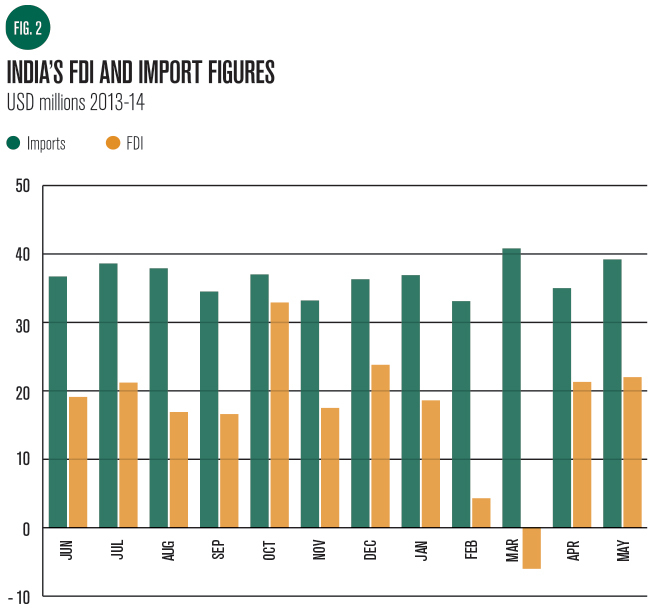 Many of India’s industries have been closed off to foreign investment for many decades, with protectionist policies being favoured over encouraging globalised competition. Regulations that limit the amount of overseas investment have led to a number of industries becoming stagnant. Modi is thought to be ready to loosen these rules, with arms manufacturing and defence industries seeing the limits on FDI removed (see Fig. 2), a drastic change to the current 26 percent restriction. Inviting newly elected Pakistani President Nawaz Sharif to his inauguration was seen as a hugely symbolic step towards building bridges with India’s neighbour. However, it was also widely condemned by Indians that still blame the country for its supposed role in a wave of terrorist attacks in 2008 and 2009. A subsequent exchange of letters showed that Modi and Sharif were planning to “chart a new course in bilateral relations.” However, Modi is still yet to make reference to the massacres of Muslims in Gujarat under his watch. Until he addresses this issue, a large and influential part of Indian society will continue to distrust him. Getting stalled infrastructure projects off the ground should form the centrepiece of Modi’s economic policy. This can be done through a number of measures, including removing red tape and welcoming investment from overseas. But it will also require the government to be bold and underwrite the projects to get them off the ground. The announcement in June of an initial investment of around $5bn into an infrastructure fund is certainly a good start, but this must be kept up in the future. The news that Japanese and South Korean investors are interested is also a good sign that the country is adjusting itself to welcome more overseas cash to help spur economic growth. While 5.5 percent GDP growth is certainly not a small amount compared with the expectations many have for India’s economy, it is somewhat lacklustre. The years squandered by Manmohan Singh’s Congress-led government mean that India has lost serious ground to China in its quest to become Asia’s economic powerhouse. Overcoming the many obstacles that India’s economy faces should be Modi’s primary concern, and getting the country to realise the vast potential it actually has will take a great deal of work. However, achieving this must be done with the full support of parliament and the country’s business community, so that instead of India forever being talked of as merely a sleeping economic giant, it will actually rise up and challenge China for dominance of the Asian economy.